The Neapolitan pizza originated in the city of Naples by unknown people, as far back as in 1807 there were 54 pizzerias (from the book by Professor Mattozzi: “Una Storia Napoletana: Pizzeria e Pizzaiuoli tra Sette e Ottocento” – “A Neapolitan History: Pizzerias and Pizzaioli from the Eighteenth through the Nineteenth Century” published by Slow Food). While the Pizza a metro (pizza by the meter) was created by the baker Luigi Dell’Amura, aka Gigino, in Vico Equense in around 1935. The flour used for the production of the Neapolitan pizza is classified as “type 00” according to Italian regulation (DPR 187/2001) with a W (flour strength index) value of 300/320 and a maximum P/L ratio of 0.70. On the other hand, the preparation of the pizza by the meter requires “type 00” and “type 0” flours (DPR 187/01) whose W value ranges between 260 and 280, the maximum value of the ratio P/L is 0.50. The Neapolitan Pizza dough is made through a direct method and the percentage of salt added to it doesn’t exceed 3% to 1 kg of flour weight, the flour is incorporated “a pioggia” (like a gentle rain) and its maximum hydration value is between 57/60%. Pizza a metro dough is obtained by the same direct method but the hydration index is between 62-65% and the percentage of salt varies between 2,5-2,8%. At 25-27 °C the Neapolitan pizza dough is left to proof for 12-16 hours, while the pizza a metro dough needs 6-8 hours to rise at the same temperature. 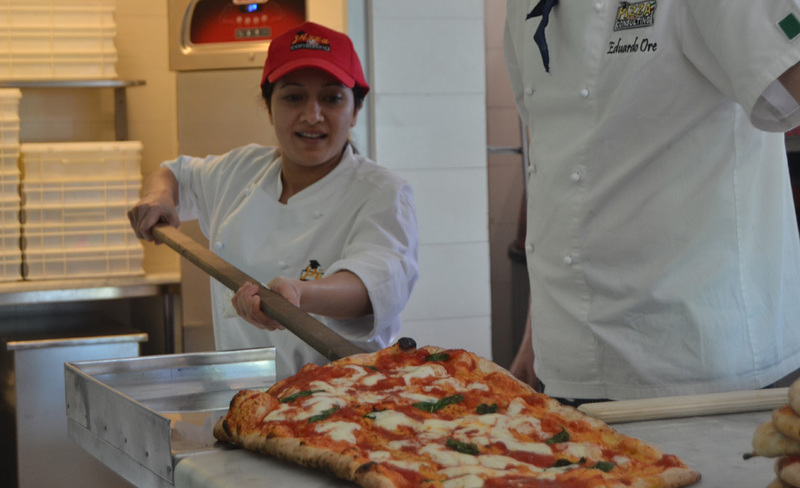 The “Pizza Napoletana” is shaped exclusively by hand, whereas the “Pizza a metro” lamination is based on the pressure of the fingertips on the loaf which is then completed by the use of a small rolling pin. The Neapolitan pizza is historically seasoned with a set of ingredients found in the city of Naples (from the book written in 1857 by de Bourcard: “Habits and traditions of Naples”). Pizza by the meter was originally garnished with Corbarino cherry tomatoes and fior di latte cheese from Agerola. The “Pizza Napoletana” is baked in semi-spherical wood-fired oven made of refractory bricks with 120 cm diameter and 42 cm x 22 cm central mouth. The oven for baking the pizza by the metee is 1,60 cm wide by 1,80 cm long with 60 cm x 30 cm central opening. The Neapolitan Pizza is baked at a maximum temperature of 480 °C and the baking time should not exceed 50-60 seconds. The “Pizza a metro” baking time ranges between 3 and 4 minutes at a maximum temperature of 350 °C. The Neapolitan pizza is a round product with a variable diameter not exceeding 40 cm with characteristics of softness throughout its surface. The pizza by the meter is instead a rectangular, up to a meter-long product, with a crispy bottom and a surface like bread. The Neapolitan pizza is usually entirely eaten by a single person. On the contrary, the pizza by the meter is brought in the serving cart and cut into slices by the waiter. These are the 10 historical and traditional differences between these two pizza styles, born just 50 km away one from the other.